After seeing my electric bill climb over the last few years, I have been researching the options for installing a wind turbine at my house. If they are going to put the wind farm in Nantucket Sound, they should allow any Cape Cod resident to install a “windmill” at their residence. The price for a residential wind turbine rages from about $400-$20000+ depending on AC or DC power (grid-tie or battery bank) and the rated output (watts or kilowatts) of the unit(s). A couple hundred years ago the Cape was home to over 700 windmills. There is plenty of wind here. I have been researching residential wind options for over 3 years now. The first thing you need to do is see if wind power is a good choice for your property. I live on two acres of property five hundred feet off the road. It does not have many tall trees surrounding it and I have only two close neighbors. I am also surrounded on three sides by one of the largest conservation areas in the Mid Cape area. The first thing I did when I started looking into this in late 2005 was to go and ask the town about residential wind turbine permits and/or restrictions. I was shuffled between the building dept. and the zoning dept. for a couple hours and then I was told that (at that time) the town did not have any restrictions or any laws governing the use of residential wind turbines. At that time they did not even require a building permit. Can you believe it? As soon as I heard this and knew enough about how to do it, I built a very small wind generator and put it on a small 20 foot tower. Having an existing wind turbine before the town said you couldn’t have one was very important to me. More often than not that little windmill is spinning. All year long, 24/7. Now I am looking to upgrade. There are two ways to do wind power. You can either have a grid-tie only system or a battery bank system. No batteries, does not store power, sends all power into the utility grid, you will not have any electricity during a power outage, any power you generate gets credited to your electric bill. Requires a battery bank to store DC power, you will have electricity during a power outage, use battery power to run DC appliances and lights, use an inverter to create usable AC voltage to power your household electric appliances or lights, can be fed into the electric grid with a grid-tie inverter. Being into self-reliance, I prefer a battery bank system with no grid-tie at all. 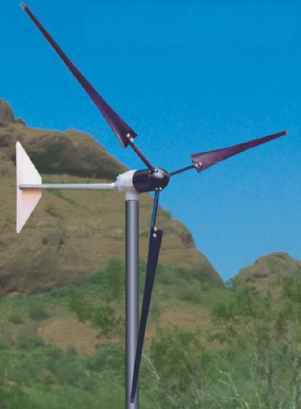 The first and the best DIY/homebrew wind power systems are/were created for places where there is no grid. For a large diameter turbine to function properly, you need the wind to be “unobstructed” or “of low turbulence” and it is recommended that the bottom of the turbine blades be at least 20 feet higher than anything within 200 feet of the turbine tower. This determines the tower height for a large diameter turbine. If you have a 10 foot diameter turbine and 50 foot tall trees on your property you are going to need a 75 foot tall tower. The inexpensive guyed towers (towers that use guy wires), take up the same room on the ground as they do in the sky. So, that 75 foot tower needs an area on the ground 75 feet in diameter which might be alot depending on your situation. Also some of the rediculous “fall zone” requirements that are now in place in many areas may put a damper on your project if you don’t have enough land. Smaller diameter turbines on shorter towers can work below the height of nearby obstructions as long as they are located strategically in reference to the predominant wind directions at your location. I am interested in charging battery banks with small scale turbines under 1KW, and like the TLG-500 and the OtherPower/Forcefield DIY Turbine kits. DO your homework before you commit to any model. I have been researching this for a few years and there is alot of B.S., hype and snake oil salesmen out there so buyer beware. If you find a model you like, make sure you search the OtherPower discussion board and do a thorough internet search for info on that particular turbine before you commit. I also am interested in putting up a wind turbine on my property. In fact, I’m in the process of getting a permit for it right now. It’s been interesing seeing the response from my neighbors. It runs the gamut from “dead set against” to “I’d like to put one in, too!”. I don’t have the best site for it, but I’m sure it will generate some power. I believe that some is better than none, and this is a lower cost system, I’m sure it will pay back fairly quickly. Hopefully I will get the permitting completed succesfully and get this installed this summer. Any ideas for ensuring the permitting? They recommend that the wind turbine be at least 20 feet above anything within a 250 foot radius. They also recommend that you have at least 1/2 acre of property. The guy wires on the tower take up some square footage but this will largely depend on how high the “windmill” needs to be. The blades on this model are 9 feet in diameter, so you are talking around 29 feet above anything within 250 feet. Around here the trees (mostly pines) are only around 30 feet high so I need a 60 foot tower. You can also get a freestanding tower, which would take up hardly any room, but these are more expensive.